Just announced today. Very sad. I will miss him but room must be made for the youngsters. One year contract. No financial terms disclosed. 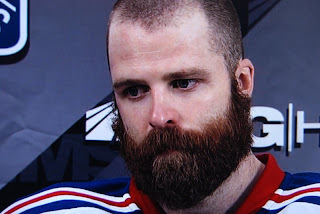 In Wikipedia, this should be the picture accompanying the entry "PLAYOFF Beard." Paul bear-hugging Clarkson into submission. Mara showing Alex Tanguay how much he will enjoy being his teammate. 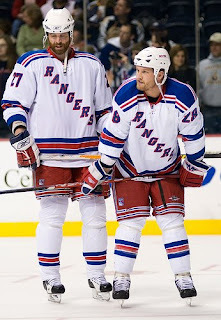 Canadian teams raided the Rangers for Mara and Orr. In other news, the Flyers lost Antero Niittymaki (which was a foregone conclusion) as he ends up with Tampa Bay. No terms announced at this time. He will compete with Mike Smith for the #1 goalie position. Smith missed the final half of the season with a concussion. The Devils picked up a backup to replace Clemmenson by taking Yann Danis from the Isles. No financial terms announced. Dannis probably earned a bundle of Metro-North frequent rail miles with his numerous trips to Bridgeport during the past season. Provided that Brodeur is healthy, Danis will be a capable backup. I'll miss the NJ Bear...i think it is criminal we let him go --- he was more devoted to being a Ranger than most. 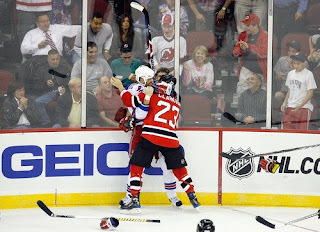 for the million it cost the rangers last season, he wasnt about to let that happen again. i would imagine he'll find 1.8 - 2M per year with montreal and i wish him the best of luck. i agree Dark. he was about as loyal as they come, even though it was a for only a couple of season. nice jump on this take tony, the Dark-ness is pretty thorough this off-=season. keep it up and i'll keep showin' up. DJ -- thanks for your comment and compliment. Come on fellas there are thirty Paul Maras out there most of which are younger and cheaper. You all just like him cause he's from New Jersey. He signed 1 year contract with Habs for 1,675,000.